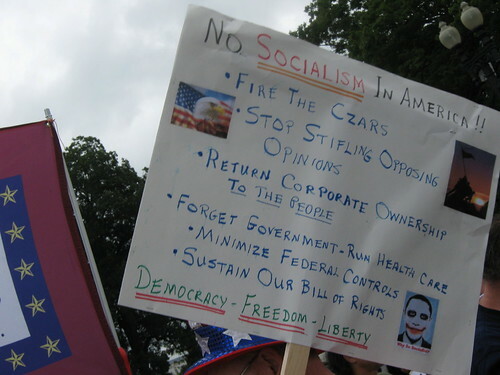 After yesterday’s post, I came across yet more posters (and a few t-shirts and hats) that really help to illustrate how crazed the right-wing has become. 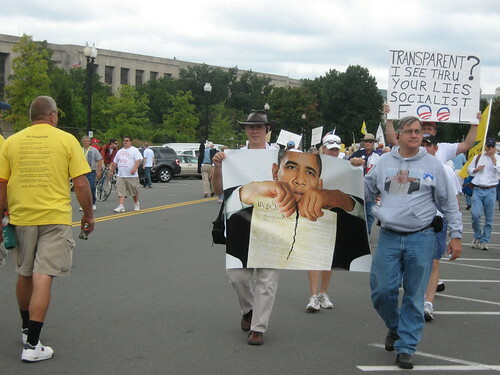 And, once again, as you look through these posters, remember that these protests are supposedly about taxes and healthcare reform, not about President Obama or racism. My discussion of most of these posters will be briefer than in yesterday’s post; most of the posters do a pretty good job speaking for themselves. 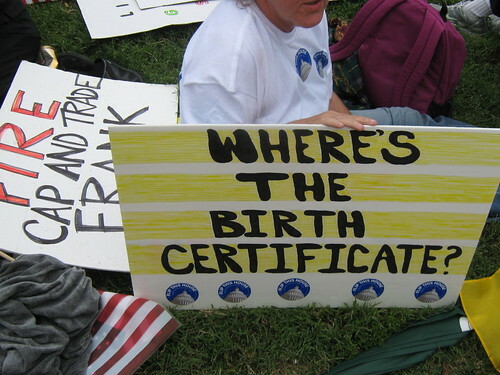 A bit more “birther” madness. Why are so many people so willing to believe this crap, even after all credible sources (including the Republican Governor of Hawaii) have debunked it? This is the first time that I’ve seen Oprah cast as the villain. Again, I don’t suppose that there are any racial overtones here? 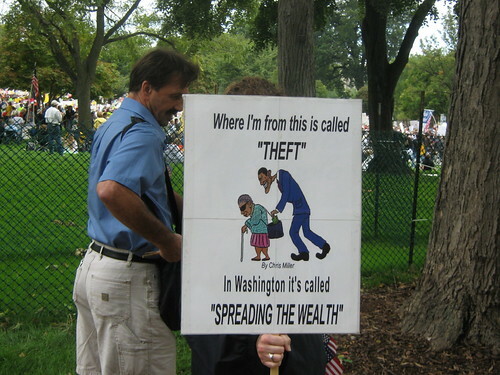 Think about what this person is saying: If you are a Democrat, you must be on welfare. 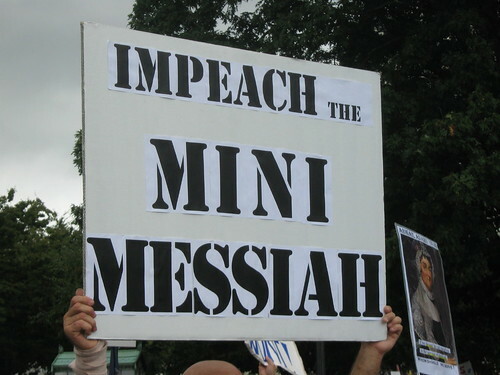 Mini-Messiah? What does that even mean? 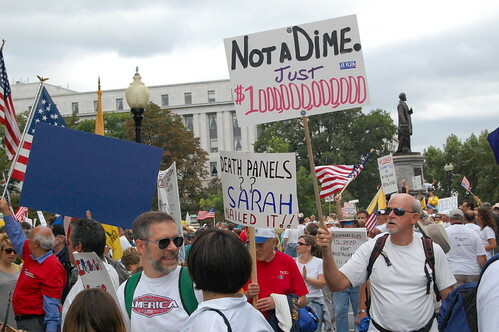 Is this a tax protest or an anti-abortion rally? I don’t know. 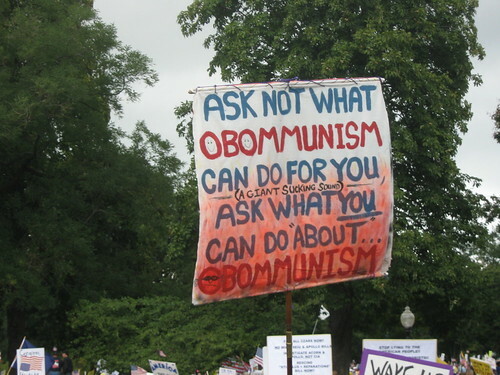 Somehow “Obamanomics” has a better ring that “Obommunism”, but I’ll give a A for effort. she is a complete and total racist! 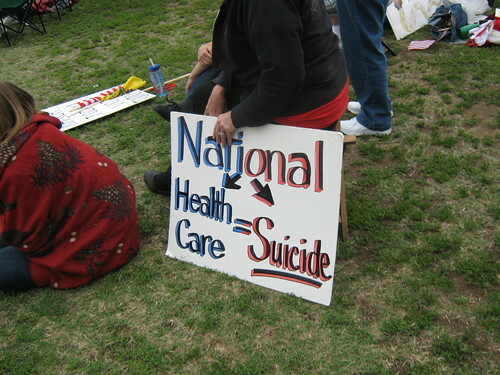 National Suicide? 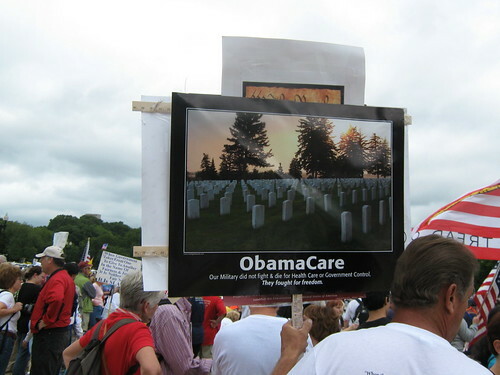 Because we want to provide health insurance to the uninsured? 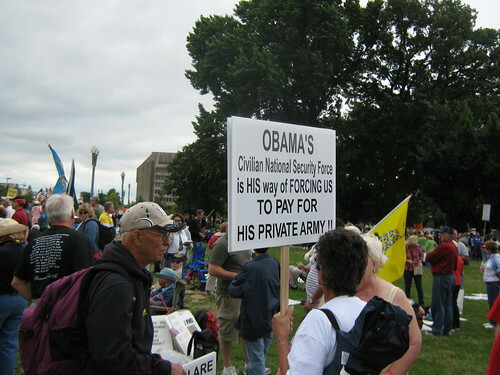 Have you seen President Obama’s private army around lately (and no, Xe née Blackwater, was President Bush’s private army…)? I haven’t even seen many mysterious black helicopters. Oh, no! 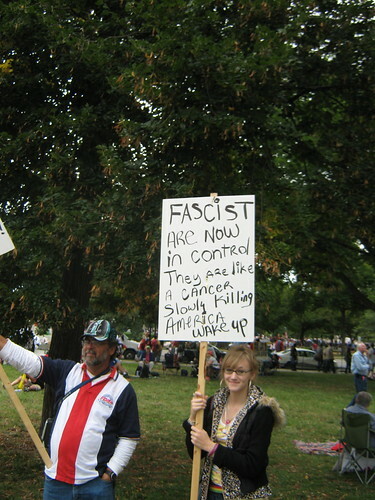 Fascists are in control. Oooh. Scary. But she’s wrong. I just love people who have such total disregard for anything approaching truth and accuracy. 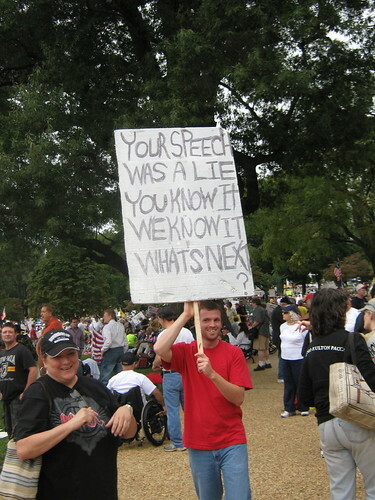 Does this guy represent the future of America or just the future of the GOP? Ah, yes. 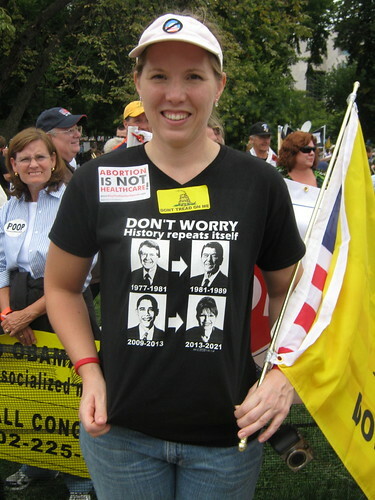 More gun rhetoric (and with a bonus NRA hat, too). That’s right. The Congressman who uncivilly heckles the President is a hero. 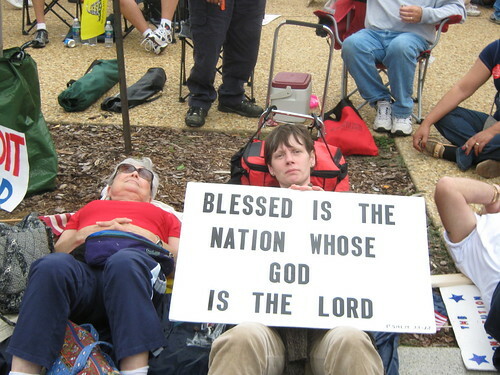 Again, just think about what that kind of mentality says about these people. 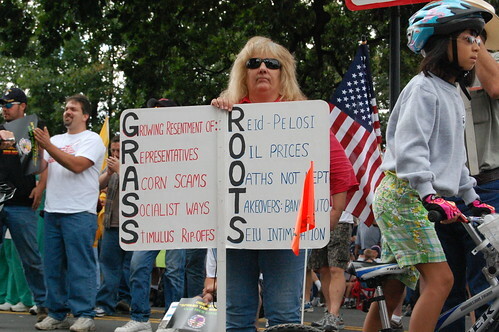 At least this person recognizes the leader of the Republican party. 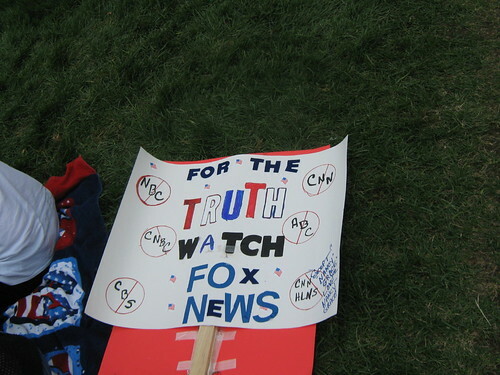 Sorry, but using the words “truth” and “Fox News” in the same sentence is … um … wrong? More of the threats of future violence. This poster also raised an interesting question in my mind: I’ve seen a number of posters that all have the same or very similar phrase. So did all of these people come up with that idea on their own or is some right-wing nutjob actually encouraging people to advocate violence? I think that there are words for people who try to organize others into committing violent acts or who try to organize others into rising up in revolution. Any ideas? Why are people all of a sudden so worked up about czars? Is it the scary-sounding Russian word? Would they be upset if these people were called administrators or advisors? 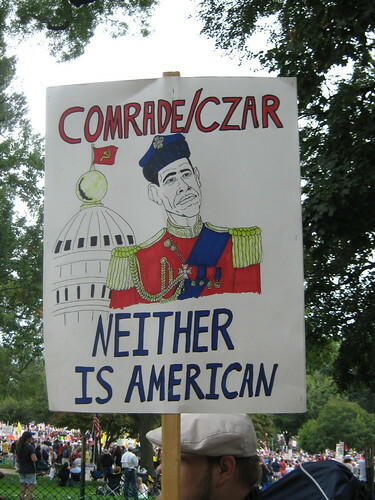 And don’t forget that czars have been around in Washington for a long, long time. Richard Nixon appointed a drug czar and energy czar. I have no problem with the discussion of whether a czar should be subject to Senate confirmation; that is a legitimate discussion. But the abject fear that is being expressed simply makes no sense. 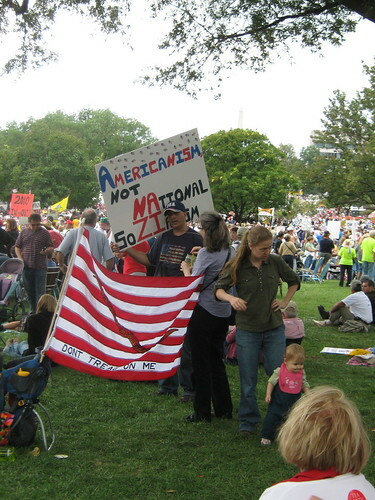 I’ve never heard of Americanism. How does it differ from democracy and/or capitalism? I’m not really sure what to say about this one. I’m trying to decide if this one is racist. 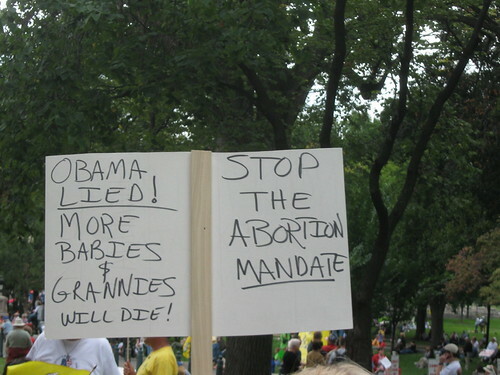 Death panels and abortion mandates! 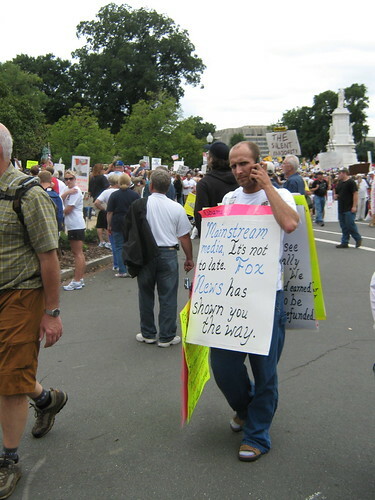 Some people are convinced that healthcare reform will require doctors to perform abortions and will require the government to pay for abortions. They’re wrong, but they won’t believe you. 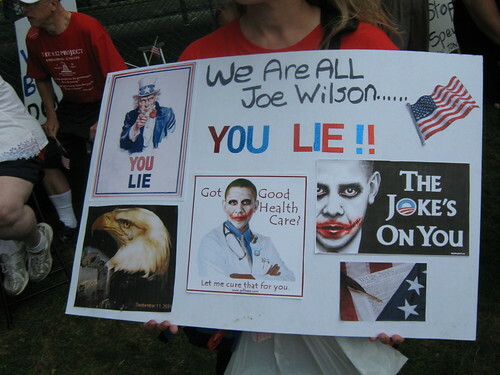 Interesting how Van Jones made this lady’s poster. Suddenly he’s become quite the boogeyman, too. 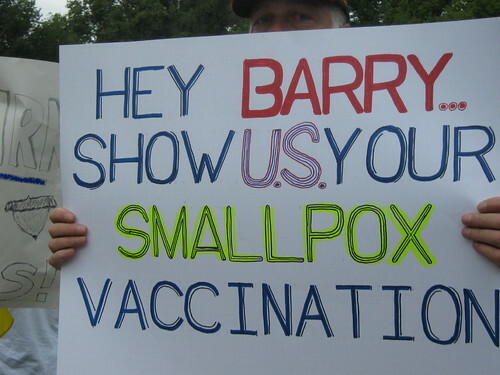 I presume that this poster is addressed to President Obama. I listened closely to his speeches during the primaries and campaign, I listened to his inaugural address, his speeches to Congress, and most of his press conference. 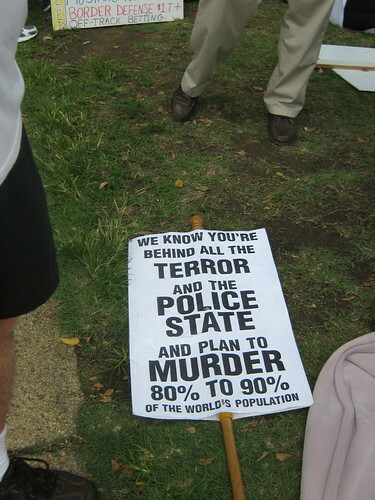 But I don’t recall hearing him say that he planned to “murder 80% to 90% of the world’s population”. Somehow, I think a plan like that would have leaked by now, don’t you? 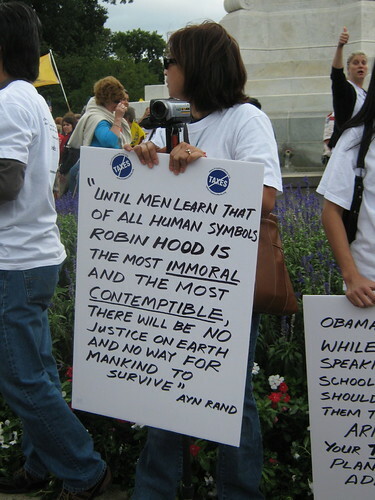 Yes, let’s quote Ayn Rand. I’ve managed to avoid reading her works, but from what I understand, she condemned altruism. I’d love to hear people of faith, in particular the right-wing Christian fundamentalists who make up a large part of the teabagging movement, explain how Jesus would respond to someone who condemns altruism. On the other hand, Rand was apparently a staunch advocate of learning by reason, something that most of these teabaggers haven’t quite latched on to just yet. 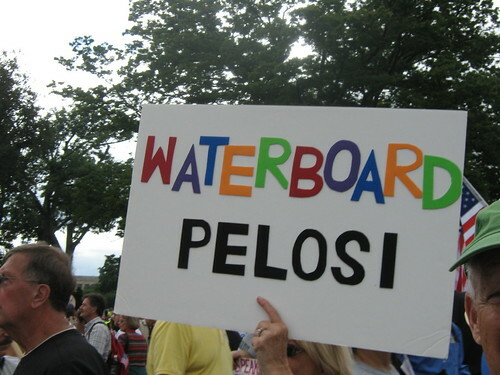 Yes, let’s be sure to torture those politicians with whom we disagree. How American. There is so much going on in this one, I couldn’t resist including it. 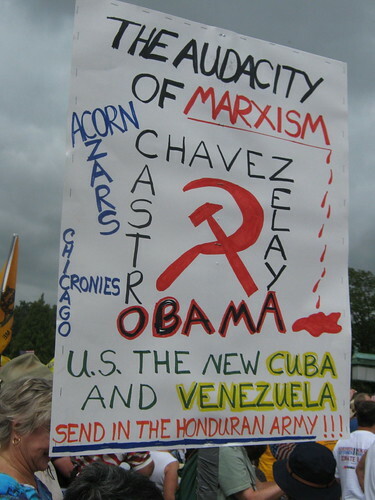 Send in the Honduran army? 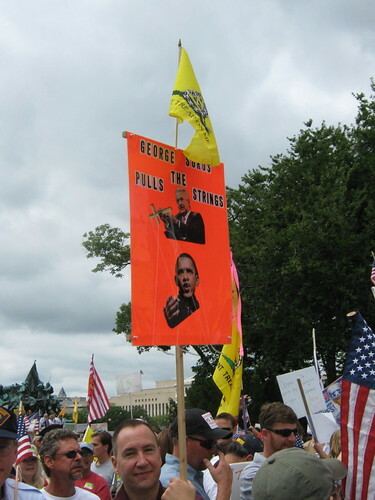 It’s hard to get a group of right-wingers together without at least one crying that “George Soros” rules the world or is responsible for everything (have you heard that he caused the financial meltdown in order to get Obama elected?). Of course, the fact that Soros is Jewish has nothing to do with anything, right? 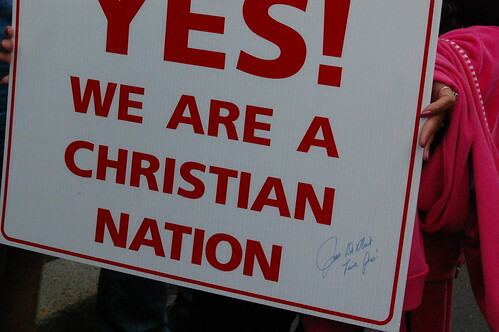 Then again, I suspect the guy with the poster probably think that the Protocols of the Elders of Zion is true. 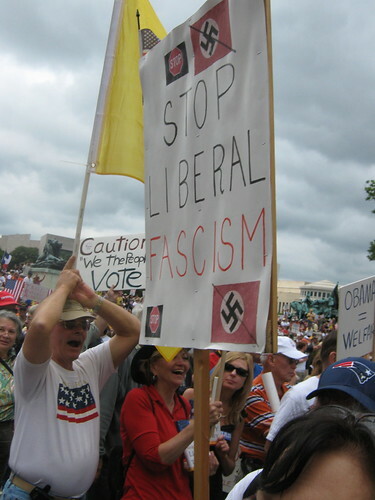 For a nice discussion of “liberal fascism” please see David Neiwert’s critique of Jonah Goldberg’s book Liberal Fascism: The Secret History of the American Left, From Mussolini to the Politics of Meaning. Don’t bother with Goldberg’s book unless you want your brain to bleed. Interesting how Robert Mugabe is suddenly popping up as a boogeyman, too. I don’t recall hearing much about him during the last eight years (or the 30 or so years before that…). 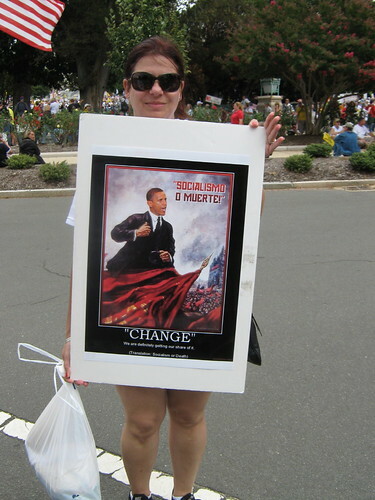 At least this woman has an eye for well-designed propaganda posters, but “Socialism or Death”? 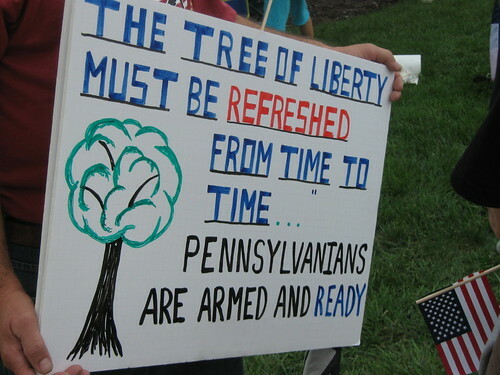 Am I to understand, then, that Pennsylvanians are ready to engage in armed insurrection against the government of the United States? 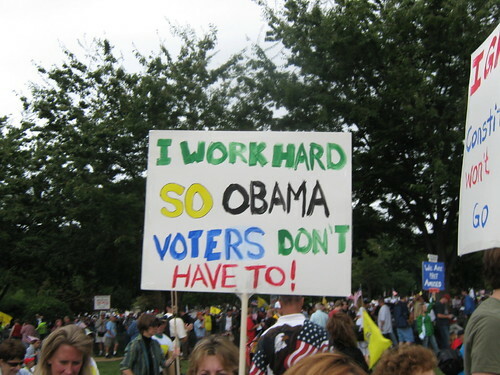 Another person who doesn’t understand the purpose of the rally. 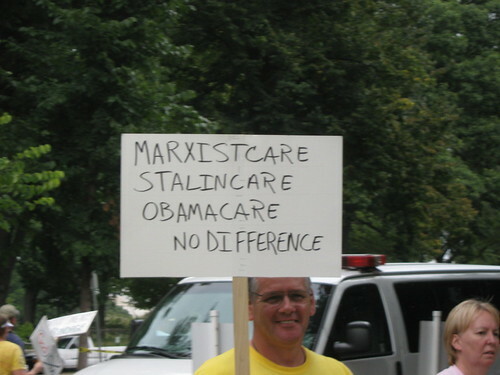 I bet that this guy has no idea what Planned Parenthood really does. 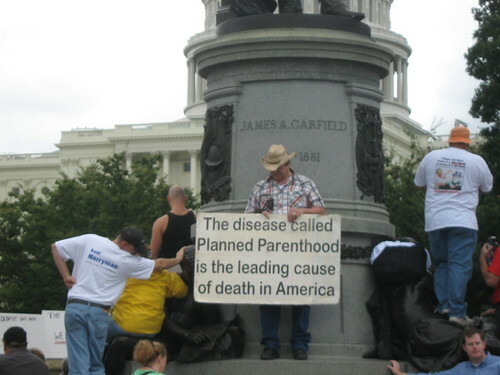 He gets bonus points for standing in front of a statue of President James Garfield who was assassinated. Coincidence? 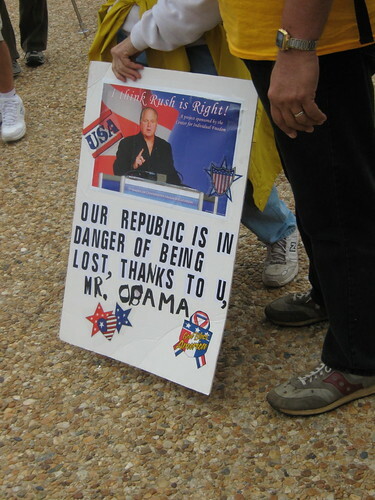 Just remember this guy and this sign in four years (or, for that matter, in 2010). He is what we’ll be fighting against. 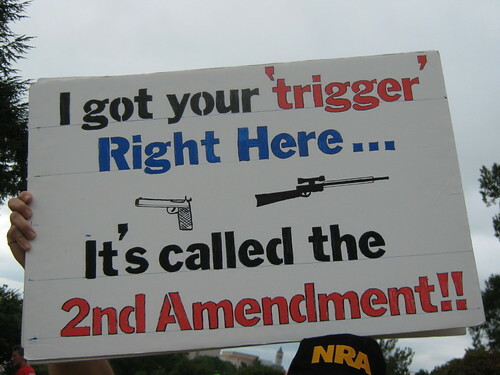 Unfortunately, weapons like truth, reason, and logic won’t work against these imbeciles. A two-for-one photo. I’d like this guy to tell me, precisely, how President Obama has shredded the Constitution and, in doing so, I’d like him to compare and contrast President Obama’s behavior with the behavior and Constitutionality of the actions of President George W. Bush. 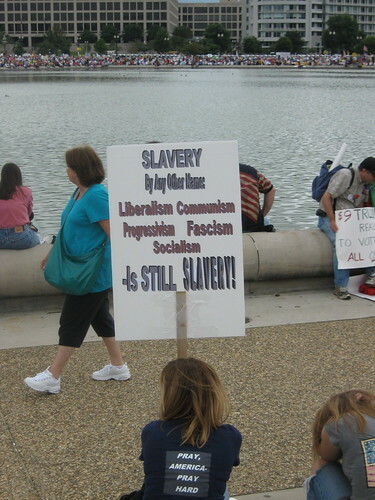 Note that in this woman’s world, liberalism and progressivism are now linked to communism, socialism, and fascism. 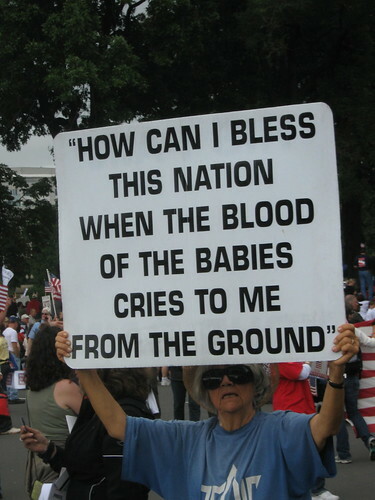 Oh, and don’t forget to “pray, America – pay hard”. 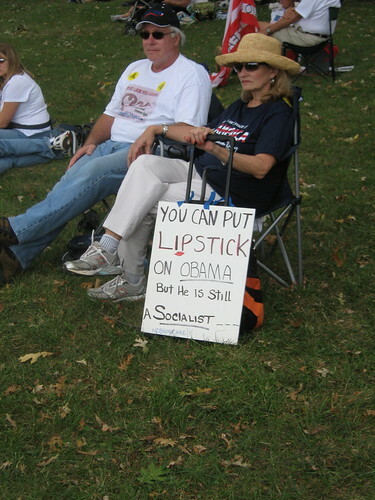 And if we put lipstick on this lady, she’d still be stupid. 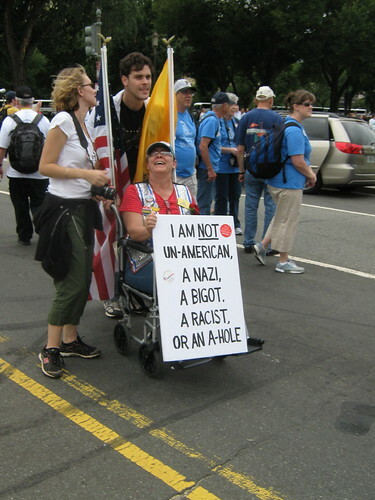 I have no reason to suspect that this person is un-American, a Nazi, a bigot, or a racist. 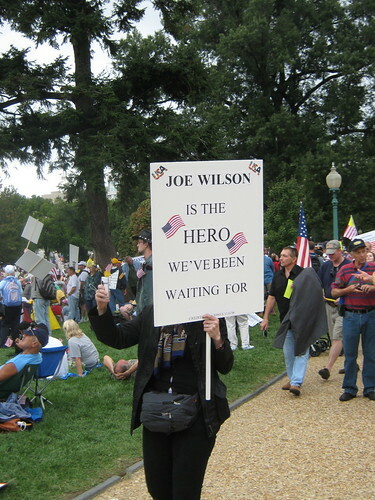 But attendance at a teabagging rally casts doubt on the claim not to be an a-hole. 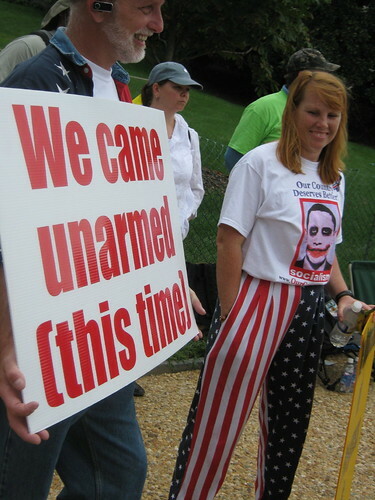 Again, in 2010 and 2012, remember this idiot and her cute shirt. 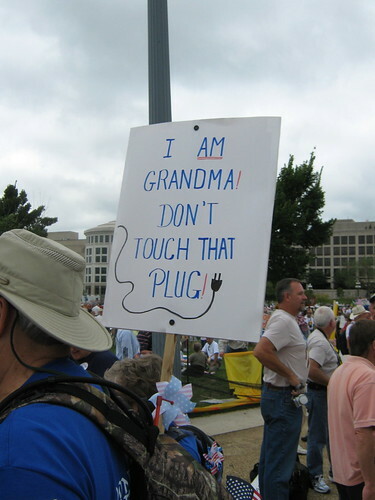 Grandma: If you don’t want the plug pulled, then be sure to prepare a living will or other end of life healthcare directive that sets forth your desires. If the current healthcare reform plan were to be adopted, Medicare would even pay for you to discuss that with your doctor! 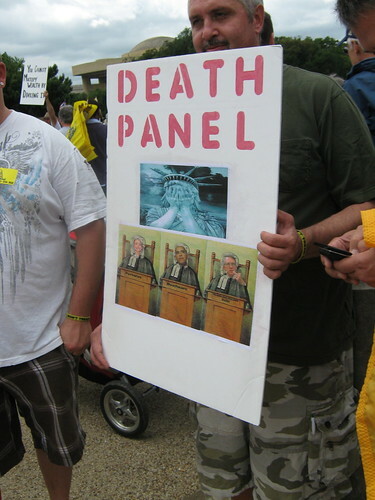 That is your death panel. You agree with a liar and an uncivil buffoon. Good for you. Your mother must be proud. 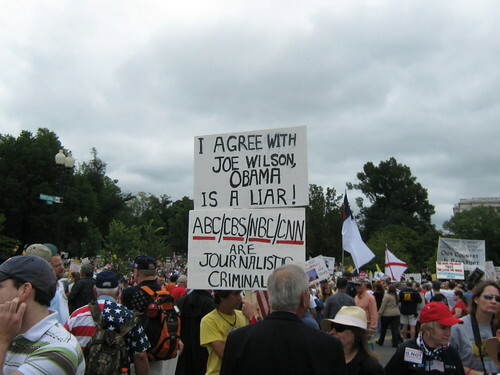 And what makes you think that all of those journalists are “criminals” and that just Fox (I presume) gets it right? I don’t suppose, just possibly, that you could have it backwards? And I’m a member of the “People With Brains Who Can Think and Use Tools Like Logic and Reason”. And I vote too. 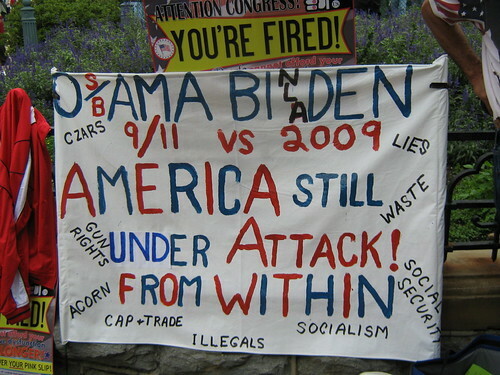 Where was this poster during the Bush administration? This guy (?) seems to have forgotten something: “Congress shall make no law respecting an establishment of religion, or prohibiting the free exercise thereof”. 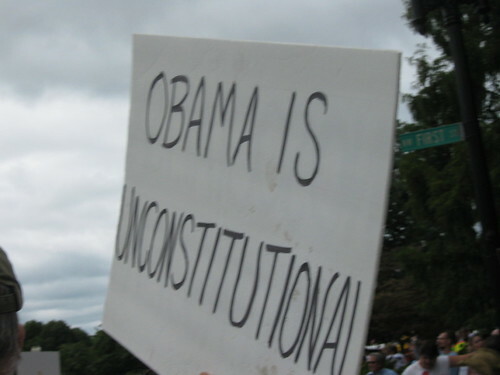 It is unconstitutional to be an Obama? 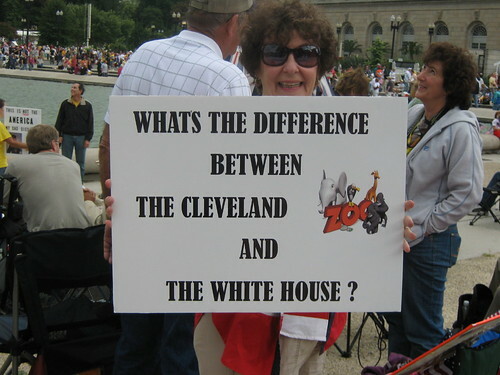 Or is Obama a verb? Yes, I’m paying attention; yes, I’m scared. 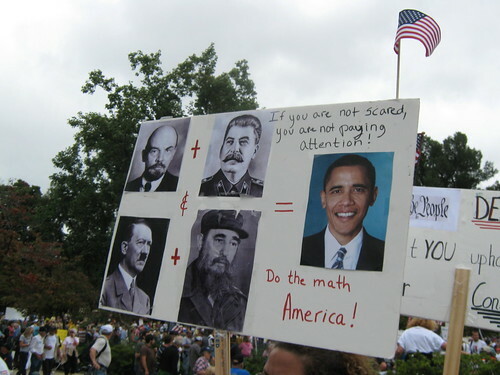 But I’m scared of you and your idiot friends, not President Obama. Fox News has shown me the way to lie, to ignore facts, to make news rather than report it, and to make a mockery of what journalism is supposed to be. Hey, let’s make a poster and use a German word to make it really scary! And we can give President Obama a Pinocchio nose, too. That’ll show ’em! 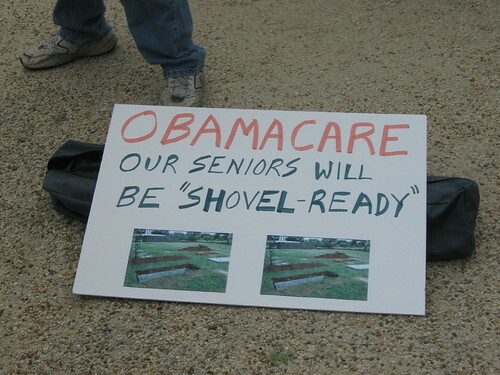 Note the inclusion of Social Security on this sign. The whole O s/b ama Bi nla den is pretty creative, even if it is stupid. 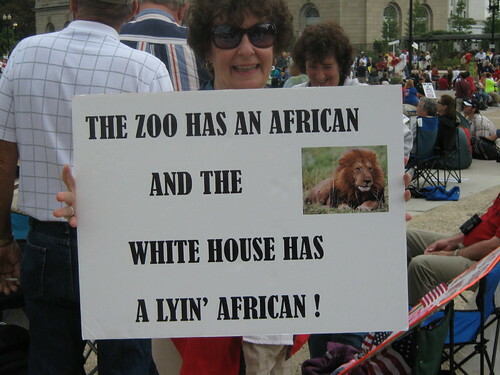 More birther crap. 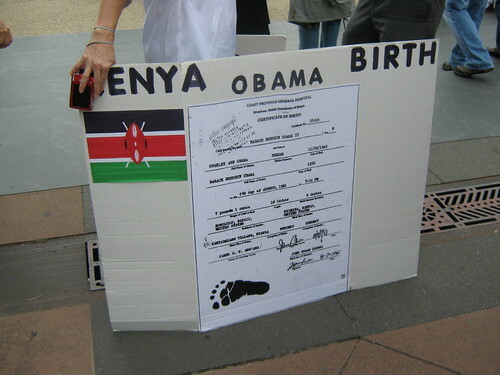 You know you’re a birther if you call the President Barry instead of Barack. Was she confused by this? 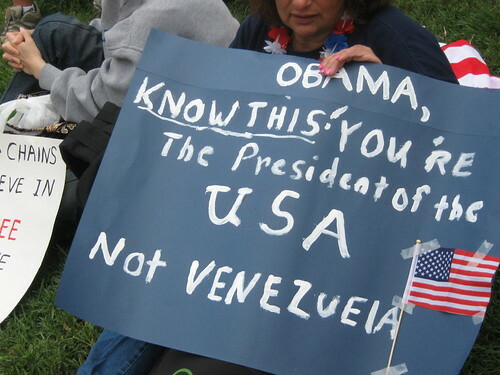 I don’t think that President Obama has been confused. 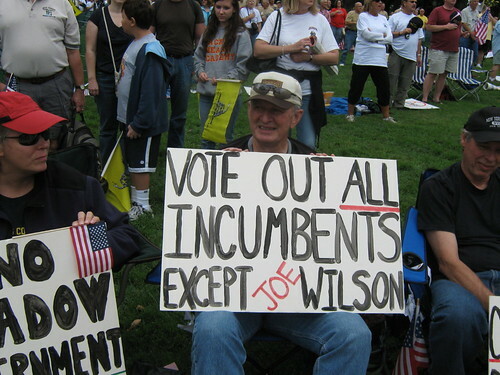 Can you imagine a Congress populated by Joe Wilson (or Joe Wilson clones). That is enough reason to start working hard right now to be sure that doesn’t happen. and another. 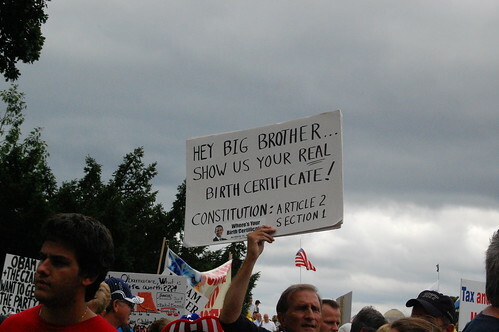 Remind me what all of this birther stuff has to do with taxes and healthcare? Talk about a laundry list of issues. But didn’t oil prices spike during the Bush administration? 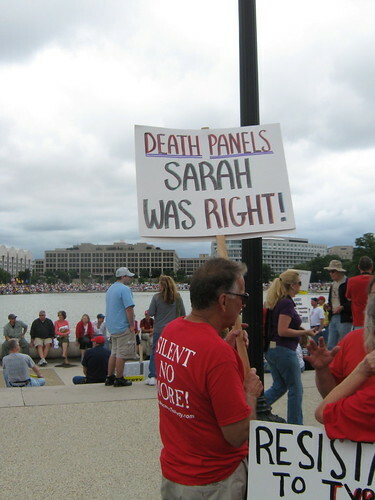 Sarah nailed it? 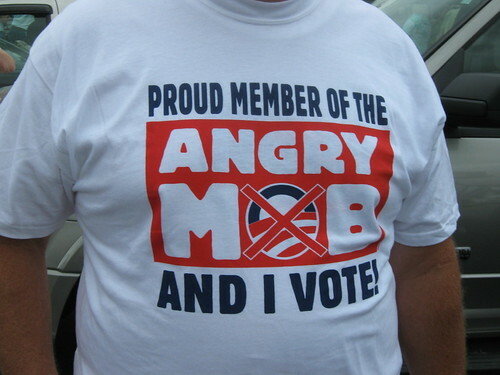 What can we say when people praise fear-mongers who lie for political gains? This seemed a nice poster to finish this batch. 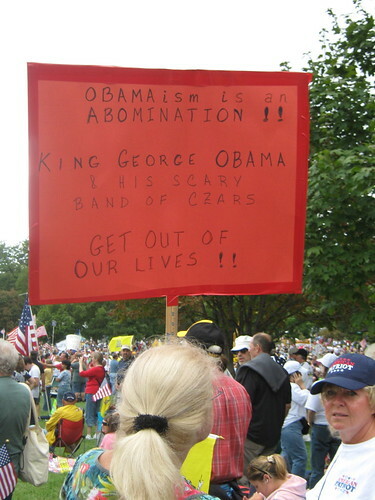 I think that it provides a pretty good snapshot of who a lot of these teabaggers really are. Finally, here’s another piece from CNN. The guy that Anderson Cooper tears apart is Mark Williams, the Vice Chairman of Our Country Deserves Better PAC, the sponsor of the Tea Party Express. This is the face and voice of right-wing insanity. And yes, Williams really did call then Sen. Obama a “Indonesian Muslim turned welfare thug turned anointed” and he’s proud of it. 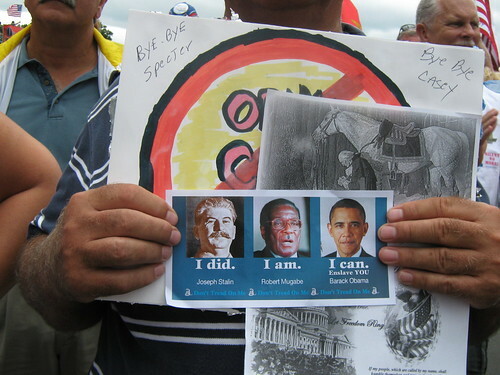 So ask yourself the following question (and I recognize that those of you with a brain will object to the premise of the question itself, but work with me): Which do you fear more: (a) Barack Obama or (b) the people expressing the viewpoints shown in these signs and videos. If your answer is (a) then, as Barney Frank would say, “Trying to have a conversation with you would be like arguing with a dining room table”. If your answer is (b), then you need to recognize that the 2010 election is barely a year away and we need to be sure that these people and the viewpoints that they espouse are defeated at the polls. 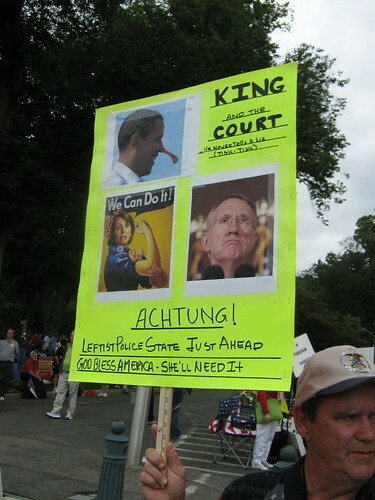 "I suspect the guy with the poster probably think that the Protocols of the Elders of Zion is true." I suspect he's never heard of it.